I was quite glad when ANONYMOUS got an Oscar nomination for Best Costumes — I saw it with my costume designer friend, whose expert eye gave it the once over and declared that it was maybe the best Elizabethan stuff she’d ever seen. And designer Lisy Christl had never done such a big film before (though her matching tennis duds and white gloves for the killers in FUNNY GAMES are one memorable contribution to cinematic dress — I hate the film, but it’s an arresting look). Though I didn’t like the film quite as much as my expert friend did, I was pretty astonished that such a handsome, unusual, well-structured and basically non-sucky movie could come from Roland Emmerich, the mind behind INDEPENDENCE DAY (credit where it’s due: that movie did cause me to go see a lot fewer blockbusters in the following years). While it’s true that every good point of the movie has some accompanying bad points, the overall experience does NOT leave you feeling ripped off and insulted, which is maybe a first for the director. The look: apart from the beautiful costumes, which are simultaneously original and convincing, the movie benefits from good mucky sets, planks strewn through muddy streets, and impressive CGI overviews — the next step on from Olivier’s vast model shot of Shakespeare’s London which opens his HENRY V, and a lot more handsome and convincing than the comparable stuff in the ELIZABETH duology. This is a big film, but not a HUGE film, so it’s an impressive achievement. On the minus side, Anna Foerster’s cinematography (or the digital grading thereof) is in thrall to the current fad for orange and teal colour schemes. There are a few welcome bits that depart from this, but generally in favour of monochromatic effects, so the spectrum isn’t exactly original. BUT on the other hand, it all looks genuinely pretty, and candlelight and firelight do at least provide motivation for the warm flesh tones. I think the fact that this look is currently over-used is the only objection — at least here it’s used well. Performances: we get a new side to Rhys Ifans in this, where he has to emerge as something approximating a leading man. We also get some fresh faces in meaty roles, which is unusual and refreshing — it can be assumed that Edward Hogg in particular, whose cold villainy enlivens many a scene, is going to be very big. And Rafe Spall gets his best role yet as Shakespeare — you know, the guy who didn’t write Shakespeare. The only down side to this is the potential for confusion in the large cast, some of whom inhabit more than one time frame, and some of whom are consequently played by more than one actor. But when was the last time you felt you had to work to keep up with an Emmerich movie? The story: the notion of the Earl of Oxford being the author of Shakespeare’s plays and sonnets may or may not be nonsense (but I highly recommend John Michell’s fascinating Who Wrote Shakespeare? for a broadminded summation of the various theories), and the political subtexts attributed to the plays in John Orloff’s ambitious script ARE complete fantasy, but the story moves, intrigues, surprises and ultimately delivers. Dialogue: only Rafe Spall really sounds like a person, but the others, working in a more stylised mode, get away with the formal speech, and somehow the obvious question — Why does everybody speak in such an antiquated way in the plays, while never using a single obsolete expression in their offstage speech — never really jumps out at you. 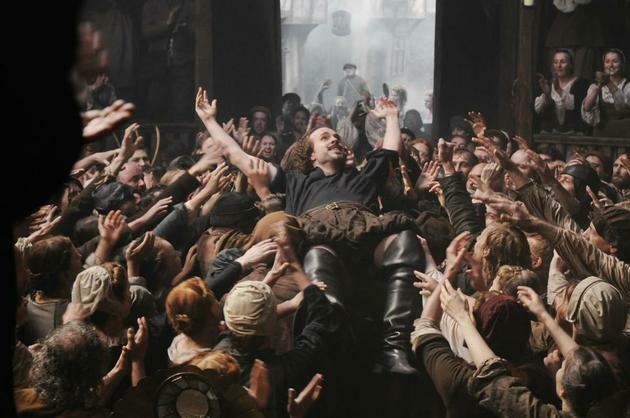 Shakespeare may not have written any plays, but he totally invented the stage-dive. Had the movie been a little less impatient, it could certainly have made this scene play a bit more convincingly, and since it cues the film’s climax (an attempted coup: basically VALKYRIE with ruffs), it’s important to try and get it right. But it doesn’t wreck things altogether. It’s a bitter irony that Emmerich’s first non-travesty has underperformed compared to the ghastly trash he’s pumped onto our screens in the past. I can’t feel altogether sorry for him, since really the director of GODZILLA deserves some grief. But it’s a shame for everyone who suffered through the big lizard but missed out on the court intrigue. Is Shakespeare a bard or a boor? It appears that it’s hard to make sure! Is it all a canard of manure? Buy John Michell’s terrific book: Who Wrote Shakespeare? The great Ken Campbell came up with the audacious, balls-out insane notion that the plays were “improvised by the actors.” To prove it was possible to improvise in iambic pentameter, he organized marathon improv sessions for actors, demonstrating that “the iambs only kick in after the twelfth hour.” But after twelve hours of it, you may find it easier to continue than to stop. And in Bob Burden’s comic, The Flaming Carrot, our hero “the world’s strangest man” travels back in time to meet the swan of Avon, only to discover a drooling bumpkin. The true author, a shadowy caped figure, is eventually tracked down, and in a surprise revelation, proves to be Buddy Hackett.